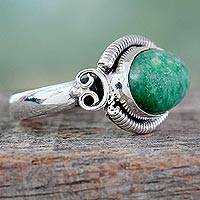 Amazonite aka The Amazon Stone aka Colorado Jade aka Pikes Peak Jade, is a potassium feldspar based gemstone. It is light green to blueish green and has a mottled green and white pattern. 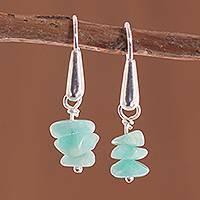 Displaying beautiful blue hues, chip beads of natural amazonite are featured in this pair of dangle earrings from Peru. Silvia Garcia designs these earrings, which are crafted of sterling silver. 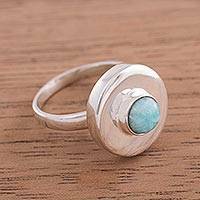 A clean, modern design is the perfect way to showcase the subtle allure of amazonite in this sterling silver cocktail ring from mother and daughter artisans Sandra and Lily. 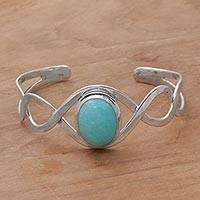 Extending above a circle of gleaming sterling silver is a perfectly-centered cabochon amazonite stone in a bezel setting. "Wearing one of our jewelry pieces will...highlight the beauty of what is natural," say the Peruvian designers. "Our philosophy is that through our accessories, people will think about caring for the planet. Through our pieces, we talk about the reclamation of wood that we recycled for our jewelry," say Peruvian artisans Antuane and Santos. 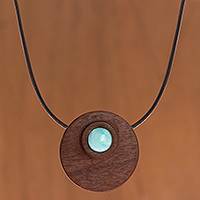 They design this pendant necklace, which features a stone of natural amazonite displayed within a circle of reclaimed aguano masha wood. The pendant centers leather cord that circles the neck. 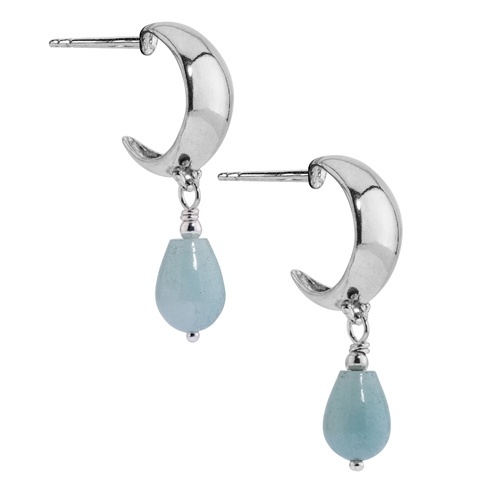 An impressive eight carats of amazonite dazzle in this simple yet chic pair of dangle earrings presented by Rituu of India. 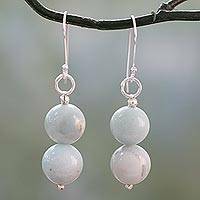 Artisans thread two round beads of amazonite and two tiny sterling silver beads on a sterling silver wire to create each earring. 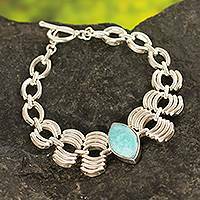 The light aqua blue color on amazonite exudes sensations of peace and serenity. 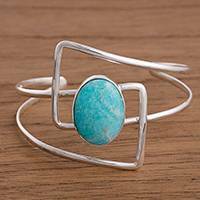 Reminiscent of DNA strands, a polished helix in sterling silver forms a beautiful cuff bracelet. 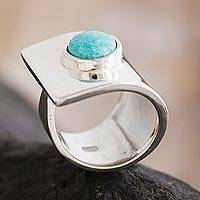 Balinese artisan Komang Suastra entwines the sleek silver shapes to house a blue-green amazonite cabochon in an elegant minimalist design. Chuleekorn selects a cool color palette for this original choker. 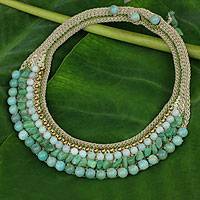 She crochets amazonite, quartz and brass beads by hand. Gemstone buttons fasten this beautiful necklace.